Just my own opinion so take it for what it’s worth but I could have used a little more shakin’ from the lovely Nicole and a little less form the host, if you know what I mean. when you put the can down and walked off screen killed me! good review. I can’t see this being something I would use on a nice piece, though that is just a personal opinion, I feel that this is probably more aimed at the weekend warrior trying to just refinish a table that is already on it’s last leg. Interesting idea though. Man U crack me up. Never a dull moment in anyone of ur vids. Thanks man. For fine woodworking, it’s hard to beat water and alcohol stains for their clarity and color. But unfortunately, being dyes, they will fade in sunlight. Pigmented wiping stains, on the other hand, have opaque earth pigments in a vehicle. They don’t fade, but won’t have the brilliance and transparency of the dye stains. 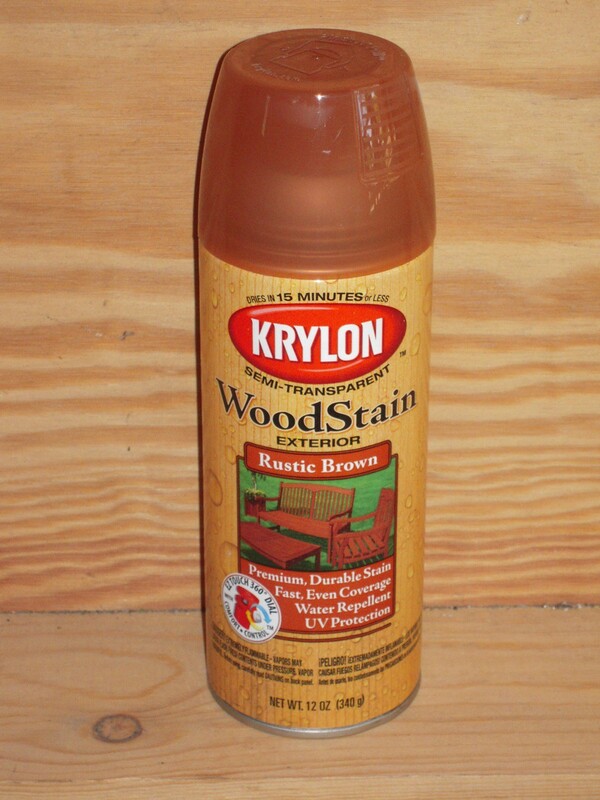 The Krylon product looks to me to be basically a pigmented wiping stain in a spray can–which if not wiped off, would seem to act much the same as exterior oil based paint. (with maybe a higher ratio of vehicle to pigment. As such, I would guess it would do best for protecting and coloring redwood, cedar, etc. Applications such as picnic tables, lawn furniture, and the like. Not the types of things one would usually build out of white oak or maple. I think the product should probably aimed more at the home handyman than at the cabinet maker. crunch, crunch, crunch. Hey man, do they make it in grass green for your rocks? Nope. that’s the old house. Marc, I have a question which is related to your video. You mention that it is over 100 degrees in your back yard. I have hesitated spraying my latest project with my HVLP sprayer because it has been around 100 degrees during the day. My fear is that the paint will dry before it has a chance to level. Are my concerns reasonable? What temperatures are reasonable for spraying? Hey Warren. That is certainly a concern. Many times when spraying lacquer, I use a retarder to stop the finish from curing too quickly. But when water-based or oil-based materials, I don’t find it to me too much of a concern. It dries quickly, but not so fast as to create a problem. Like I said, spraying in these high temps is not ideal, but sometimes I have no choice. And frankly, the lower temps are more of a problem for me than higher. I used this product prior to seeing this review (even the same color). As Kevin suggested above, I used it to refinish a table that was on its’ last leg. And I concur that it looks much better if you wipe it off. So why not just use the normal stuff in a can and wipe it off? I think I paid about $15 for this can. Oh well, live and learn. If I could only post a pic here of when the kids stained a homemade skateboard with it haha. I guess it was good for some family time. Kids like the spray paint stuff a heck of alot more than they do with real stain for some reason.